Farah Alvin in Pirates! at the Paper Mill Playhouse. News, views and reviews about the multi-talented women of the musical theatre and the concert/cabaret stage. Broadway actress Farah Alvin is singing a different tune these days. Actually, she's singing the songs of Gilbert and Sullivan in the Paper Mill Playhouse's acclaimed production of Pirates! , an adaptation of Gilbert and Sullivan's classic operetta The Pirates of Penzance that was conceived by Nell Benjamin, John McDaniel and Gordon Greenberg. Known primarily as a Broadway belter � one who possesses a rangy, textured alto � Alvin is utilizing a different part of her voice in the New Jersey production, where she gets the chance to demonstrate the power of her soprano. Greenberg, who also directed this version of Pirates! , which premiered at Goodspeed Opera House in 2006, told Playbill.com earlier this week, "Nell and I had a notion to make Mabel an adventurer � the one member of the Stanley family that engages with her environment. After seeing many wonderful actor-singers for the role, we finally thought of Farah, with whom we had worked on Cam Jansen. She happened to be outside in the hallway on a rehearsal break for another show. Alison [Franck, our casting director] grabbed her, and she was spot-on in her reading. She inherently understood the character and sensibility of the piece. Farah brings a unique intelligence, wit and humanity to the role � and a glorious voice. She's a true collaborator and such an authentic person. I'm very grateful to be working with her again." Alvin, who made her Broadway debut in the '90s revival of Grease , has also appeared on Broadway in Saturday Night Fever, Nine and The Look of Love . The gifted performer has worked regionally and Off-Broadway, including a lauded performance in the Off-Broadway musical I Love You Because , which co-starred Stephanie D'Abruzzo, Colin Hanlon and David A. Austin. Alvin recently chatted about her many theatrical outings. Question: Let's start at the beginning. Where were you born and raised? Farah Alvin: I grew up in Los Angeles, California. Alvin: I started performing professionally when I was still a senior in high school. I got my Equity card with the Los Angeles premiere of Fame: The Musical in L.A. Question: Do you remember when you started performing as a kid? Alvin: I was a competitive figure skater, and it was getting very expensive and complicated, and I wasn't loving it as much as I used to. The first time that they had kids on "Star Search" on "Junior Star Search" . . . I begged my mother to let me go on. She said, "Farah, those kids work really hard, just as hard as you work at skating. You can sing, but you have to really work hard like those kids." I cried for three days, and by the end of the week, she let me quit skating and start taking voice lessons. That was about the point that turned for me. Question: Were there any singers at that time that you admired? Alvin: I grew up listening to Judy Garland and to the first two Barbra Streisand albums. I used to fall asleep listening to those. My mom didn't play me kids' music. . . . I [also] had the Ella Fitzgerald Carnegie Hall album, [which] I used to listen to all the time, and there was an Anne Murray album that I loved; just real soulful, rich voices I always fell in love with. Question: When did you know that performing would be your career? Alvin: I don't think that I knew it as much as much as other people knew it. I had a very mature talent, much more than I was emotionally or mentally mature. So people would hear my voice and go, "We have to do something with that." I wasn't really ready, and I definitely pulled my own foot off the gas pedal until I was probably in high school. I won a scholarship competition through the Music Center of Los Angeles, called the Spotlight Awards, when I was 16. It came down from hundreds of finalists to two. And then I won, and the young man that I beat had representation with an agent in Los Angeles. So, after the fact, I sort of went, "Maybe I'm ready to do this," and I called his agent and I said, "I just beat your client in a competition," and he said, "Well, if you won, then I guess I have to meet with you." [Laughs.] He started submitting me and from that point forward, it seemed obvious. It seemed like, "Well, I guess I'm ready to do this now." Question: What year was that? Question: And then did you perform mostly in L.A.? Alvin: No, I've been in New York for 12 years. I moved to New York at 17, no 18 � I'm turning into my mother and reducing the age! [Laughs.] I moved to New York when I was 18 years old. I had a scholarship to Brooklyn College of Music that I decided to defer. I came to New York to audition. I got representation rather quickly . . . and then I had a callback for A Christmas Carol at Madison Square Garden, the second year they did it, with Ben Vereen and Terry Mann, and I got it. I was [only] here for three weeks [at that time] . . . so, again, it was sort of like the universe was trying to clue me in, like, "This is where you're supposed to [do]." So, I stayed. I didn't work for about a year after that, but . . . I've been in New York since then and working professionally since then. Question: What was your first Broadway credit? Alvin: First Broadway [show] was Grease . I did the national tour. I played Jan, and then I came into Broadway as a replacement. Question: When you finally got to Broadway, what was that experience like? Alvin: It was a strange experience. Christmas Carol , although not in a Broadway house and not considered a Broadway show, the people that I was working with there were people that I had been admiring for my entire life. The first person who introduced herself to me at the first day of rehearsal was Susan Stroman. She walked over to me and said, "Hi. Are you Farah?" It wasn't even like I was looking at her going, "Oh my God, that's Susan Stroman." She came over to me, and I about fell on the floor. So to work with Paul Gemignani and . . . even people in the ensemble: Eric Riley. Once On This Island is one of my favorite shows of all time, and Eric Riley was in that show, and he was playing my husband in the first scene. Once I realized who everyone was and that I was in that company, I was completely bowled over. By the time I got to Grease on Broadway, having done the national tour, it sort of felt like I had been through a Broadway experience already. However, that show was a huge hit. It was really entertaining, and people loved it. To be able to do something that made people so happy everyday � I did Grease for almost two years total � was really exciting. I came in after Rosie [O'Donnell] and Megan Mullally, but even to see people like Hunter Foster and Jen Cody and Sutton Foster � all people that I worked with at very early stages in their career � to watch them all go on to such incredible success, in hindsight that was a very exciting time. 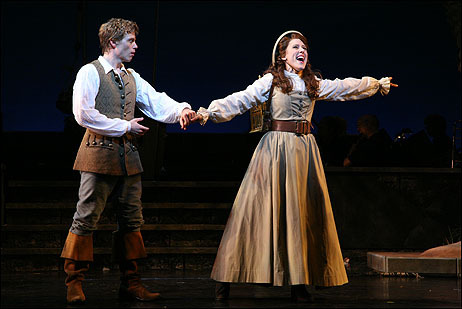 Question: Do you have a favorite Broadway experience so far? Alvin: I think Nine was definitely my favorite. I came into Nine as a replacement and was fortunate enough to work with [choreographer] Jonathan Butterell and [director] David Leveaux. You don't always get the advantage of working with the creative team when you come in as a replacement, but because I came into the ensemble and there were new stars being put in, I had the opportunity to work with the creative team. David, I felt, really focused on making it a piece of theatre that happened to be a musical. To me, the level of artistry involved in that show was just so exceptional, and I felt so proud to be included. I loved being in that show. Although I was not there for very long, it was a really thrilling experience. Every night, I loved being in that show. But a lot of my favorite experiences, theatrically speaking, have not been the real high-profile things. I think that each thing has its strength and its weakness, and a lot of times something that doesn't have a lot of money behind it sometimes has a lot of love and a lot of creativity behind it. Question: What was your experience like in I Love You Because ? Alvin: That was a wonderful experience. They had not written that role for me, but I felt like they had. To fall into something [where I] really felt the character was so much an extension of myself and also to be involved with something essentially from the beginning, that was a really exciting moment for me in my career, to be able to create something. That's where I think you feel, as an actor, like you've really accomplished something. That was a thrill, and people loved that show so much. Question: It was a shame it didn't have a longer run. Alvin: The business part of [show business], I try and keep my mitts off of as much as possible. [Laughs.] People really loved it, and I'm so proud that we were able to do a cast album of I Love You Because because it has had a life and will continue to have a life beyond that. I think that the album came out beautifully. For the people that got to see the show, I'm glad that [the album] is there as sort of a memory of it, and I'm also glad that it exposes people [to the piece]. I've heard that they're doing it in Kansas City this year, and I know some kids in college have contacted me through my website saying, "I found this, I love it, the show is amazing. . . ," so I'm so glad that it can have some life beyond what we did. The experience that we had there was wonderful. It was a very creative environment, and it was an amazing cast of people. Question: You mentioned that some of your favorite experiences haven't been the most high-profile ones. I'm just wondering what some of those are. Alvin: They'll probably kill me for saying this, but I do a lot of work at the NYU graduate Musical Theatre Writing program, and I've been doing stuff there for 11 years. That program has grown and changed while I've been going there. They hire actors to come in and do people's theses and things like that. Years ago I did a one-act play that Rachel Sheinkin, who won the Tony for Spelling Bee , wrote when she was a first year grad student � a piece that she wrote with a composer named Joel Derfner, that two years ago went to the O'Neill Center. It was just a one-act at the time. It was really a class project, and it's turned into something else, but that was one of the most beautiful pieces that I've ever done. Question: What was that called? Alvin: It was called Blood Drive . I'm not sure what the working title of it is right now, but I think it was still called that at the O'Neill a couple of years ago. . . . I still remember the music from it, [and] this had to be six, seven years ago now. Things like that are really thrilling. One time there was a Dramatists Guild event [where] I sang for [composer] Bill Finn, and it was like a who's who of theatre. They were doing songs and scenes cut from famous plays. Arthur Miller was there, and David Henry Hwang was there, and Tina Howe was there, and Edward Albee was there. Stephen Sondheim introduced the opening number to West Side Story , which once had words. It was a fascinating evening, and every important living playwright of the 20th century was sitting there. That was something I probably got paid cab fare to do, but what an incredible evening to be a part of. Question: You've done mostly musicals. Do you have a desire to do more dramatic work? Alvin: Yes, I absolutely do. I really feel that this year's big goal is to start looking into doing some commercial work, but as far as film and television are concerned, of course I would love to do it. I think anyone would love to do it. I feel like it's a skill set that I haven't really developed yet. But [with] the roles I've been playing over the last year, even in musical theatre, I feel like my acting chops have been getting stronger and stronger. For a long time, I was doing parts like [understudying] Capathia Jenkins in The Look of Love � a part I would call a "park and bark" part, where you just stand and sing real loud and real pretty. And then I've done a lot of concert work, and it's the same thing, where the orchestra introduces you, and you come out and sing beautifully and you leave the stage. It's just a muscle. Your acting muscle is something that you have to develop and feel confident about, and over the last three years [I've played] a lot of roles in regional theatre. I just did a production of I Do! I Do! , and a couple of years ago played Fanny Brice � things like that where you really have a huge dramatic arc to carry by yourself [and] you kind of go, "Okay, I can do this." And so, it's a big goal for me. That's actually one of my big career goals right now is to try and do something where they don't ask me to sing. [Laughs.] But I love it! Honestly, if I can play a role, I'm happy, whatever it may be. I think there is so much drama and creativity to be mined in musical theatre. . . . If anyone lets me play a character, I'm happy for it. Question: You're also a songwriter. Question: How would you describe the music that you write? Alvin: I describe it as jazz-influenced folk pop. That's a lot of words and a lot of styles all rolled into one, but it's not theatre music. I would say my main influences are Joni Mitchell and Laura Nyro. There's a little bit of Ben Folds thrown in there, a little bit of Paul Simon thrown in there. So musically speaking, it's sort of a jazz or gospel style primarily. But lyrically, the lyrics are very folky and quirky and introspective. Question: Do you get to perform your music? Alvin: I do. I just did a concert with my band at the Laurie Beechman [Theatre]. It was part of their Broadway Spotlight series, but they were very gracious. I said, "When I perform out, I don't sing my favorite songs from Broadway. I sing the music that I wrote. Is that okay?" And they said, "Yeah, absolutely." So that was nice. I sold my album when I did I Love You Because . I sold it at the box office. People would pick it up after the show, even though it's very different, [but] my fan base has grown from that. When I'm able to be in town for longer than a month and a half, I do perform my stuff. Question: How did the role in Pirates! come about? You originally did it at Goodspeed, right? Alvin: I was supposed to be doing [the revival of] Les Miz . I was cast in the ensemble of Les Miz , which was a huge thrill because the company was really amazing. But I sort of had made a decision with my agent and with my career that I didn't really want to go back to the ensemble on Broadway. It's a wonderful experience [being in the ensemble], I'm not saying anything negative about it, it's just an experience I've had many times now, and it's my hope to move on and play roles. I was doing If You Give a Mouse a Cookie , and we were rehearsing at Chelsea Studios, and I literally bumped right into the casting associate for Pirates! in the halls. He said, "Why aren't you coming in for this?" and I said, "I don't know!" Well, first I said, "Because I'm 30 years too young to play Ruth." I wouldn't even dream in a million years of playing Mabel � I'm not a typical G&S Mabel. So he ran back into the room, and he came back out and said, "You're right for Mabel in this. They heard you were doing Les Miz , and that's why they didn't call you in." I said, "Well, they should call me in anyway because I haven't signed the contract, and I'd like the opportunity to audition." I've never played a legit role onstage prior to playing Mabel. Nine was the closest to singing legit music that I've ever done on a professional stage, because I'm known primarily as a belter and as a pop singer, and this was strictly territory that I've tried to steer clear of. [Laughs.] But I thought, "Well, here's an opportunity, and I'll go in." I've worked many times with Nell Benjamin and with John McDaniel and with Gordon Greenberg. The only member of the creative team who I had not worked with before was Warren Carlyle, our choreographer. So, it was a very warm and accepting room. I went in, and then they called me back, and much to my surprise, I got the job. I was really surprised and because of the way that it timed out, the Les Miz people were very gracious and let me go. I had not signed a contract, and it all worked out well. That was one of the only auditions I've ever even had for Goodspeed, and although I technically didn't audition for the Paper Mill production other than with my Goodspeed performance, I haven't had very many auditions for Paper Mill Playhouse either. So it's my first time at Goodspeed and my first time at Paper Mill with this show. Question: What was the Goodspeed experience like? Alvin: It was great! I mean, it was really thrilling. I had a big landmark birthday while I was there, and I felt so proud of the work that we were doing. It was a very creative process. We had four weeks, and there's a lot of new material in this. When people see it, I think that they will be very pleasantly surprised at how much new material there is, so there were rewrites. You don't expect that [when] going in to do Gilbert and Sullivan, but there were rewrites, and there were musical changes, and there were all kinds of developmental things. Question: Is there any new music in it? Alvin: Well, the new music is music that is also Gilbert and Sullivan music. There are two songs that are from other G&S shows. There's "The Curse," which is from Ruddigore , and "The Nightmare Song," which is from Iolanthe . They've been transplanted and reworked so that they tell this story. Question: Are you singing in your soprano? Question: What's that like for you? Alvin: At first it was very frightening � for me, not for the audience. [Laughs.] But it's funny because Michael O'Flaherty, who is the resident music director up at Goodspeed, had me do something for a promotional event. He said, "Will you sing 'He Plays the Violin' from 1776 ?" which they're doing the next season, and I said, "Sure." That's exactly how I sing all the time, in that sort of mix-y belt voice. That's how I've made my living for almost 15 years, and he went, "Wow, you've got a great belt voice," and I almost fell over, because I thought [that] nobody's ever not known me to have a belt. I felt as if my secret identity was suddenly revealed. But while it's still a little bit frightening and I'm still [singing] a little bit more in my head technically than I would like to be, I have a wonderful voice teacher who has given me excellent technique. So it's actually much easier to do than belt singing, because I don't ever get physically tired from singing soprano. I could kind of do it all day. So that's been an interesting experience, although the show is physically exhausting. The hard part is because we are making this into a piece of musical theatre � that was Gordon Greenberg's real goal, [that] we want this to feel like a musical, we don't want it to feel like an accessible opera. "Poor Wandering One," which is traditionally a "park and bark" song because it's physically very difficult to sing, is fully staged. There's dancing, and it's a very busy musical number. There's a lot of story being told, so figuring out a way to not only sing soprano, which is not necessarily something that I feel comes natural to me, and to be in a play and dance and waltz and find your breath. That's been a really interesting challenge, but a good one. Question: Paper Mill has been so much in the news the last couple of months, financially. What's the experience like working there? How has the morale been? Alvin: Morale for this show has really been fantastic. I think we were all so happy that it was happening at all. Word was, for a moment, that it wasn't going to happen. And then it had to happen in nine days of rehearsal! It was almost like everyone jumping into a put-in, or jumping into tech, for a regular production. So there was a real hyper-focused attitude, and everyone was keeping their cool. Everyone was sort of at their wit's end but also really focused on getting the job done. Now that we've actually managed to do it, and the production is beautiful, we're all so proud and so excited to be doing what we're doing. It was a stressful time, obviously, and it's been stressful for Paper Mill. Unfortunately, I don't think I'm having what would be an authentic Paper Mill Playhouse experience because we jumped in so quickly. We rehearsed at the theatre, and it was all very different from what other people experience working at Paper Mill Playhouse. But it's been a real labor of love, so we're proud of what we've done. Question: Is it a concert-style version of it? Alvin: I feel like we're saying it's a concert version because we have the orchestra onstage. . . . [but] it's fully staged, fully lit, fully costumed. There are as many technical and set elements as we were able to incorporate into a revised set design that included the orchestra [onstage]. I feel like the concert version [labeling] is there so that people understand there is no pirate ship because there were nine days of rehearsal. But I think that people will be very thrilled and surprised at how fully realized the show is. Question: How have audiences been responding so far? Alvin: They've been going completely crazy. It's so exciting that at the end of the show we take a bow and we all kind of throw our fists in the air and we yell "Arrr!" at the audience, and they all yell it right back at you! They're standing and they're yelling and screaming � it's like a rock concert. There's something in your brain that goes, "We just did Gilbert & Sullivan. How did that happen?" [Laughs.] This is so funny and so accessible and so contemporary. Much of that has to do with the original material, and much of it has to do with Nell Benjamin's adaptation. Little kids are completely wrapped up in it. From the moment that the show starts, you can see these little faces just completely caught up in whatever is going on. Gordon said that the other day during a preview, after "Modern Major General," that these three little kids, all under eight, just stood up and clapped at the end of the song, so thrilled at what they were seeing. John Lithgow did that album of musical theatre songs that are exciting for kids to listen to. I think this has that same kind of appeal. Nell Benjamin . . . also wrote Sarah Plain and Tall , which has been done several times by Theatreworks. If anyone is familiar with that or has heard it, what's beautiful about that show is that they billed it as a family show, and it really is. There's a lot to grasp and a lot to grab onto as an adult, and it's very entertaining and accessible for children. I think she has a real knack for writing for the family. I feel like she's hit on it again with this show. It's clever and funny, and audiences have been going crazy. When you see a whole audience of primarily senior citizens stand at a Thursday matinee, you've done something really right. But I also think that people are just so happy at Paper Mill, to see a real show up onstage, considering what could have been. Question: Is there any talk of another production of this elsewhere? Alvin: I think that there is some commercial interest in it, but it's all still being worked out at this moment. It would really be a shame to not have it go somewhere else and let other people see it and have this experience. Of course, I'm a member of this cast, but I think that this cast is really phenomenal. I think the other actors in the show are so good and our ensemble is so good, and the piece is terrific. I'm sure that that was, in part, their goal in developing something that was a public domain piece. Hopefully, it will go on somewhere. There's been discussion about a variety of things. Question: What's up for you next? Do you have other projects after this? Alvin: Right now I'm auditioning. I'm going to Indianapolis to go do a summer concert with the symphony orchestra there, and I have a couple of readings and things like that planned. But at the moment, just waiting for something fantastic to come along! Barrett Foa and Farah Alvin in Pirates! at the Paper Mill Playhouse. The ninth annual Broadway Barks fundraiser will be held July 14 in Shubert Alley beginning at 3:30 PM. Co-hosted by Tony winner Bernadette Peters and Emmy winner Mary Tyler Moore , the dog and cat adopt-a-thon benefits New York City animal shelters and adoption agencies. Produced by Broadway Care/Equity Fights AIDS, the afternoon includes celebrity presentations of pets from animal shelters throughout the city. The celebrity presentations will begin at 5:30 PM and will include such theatre folk as Angela Lansbury ( Deuce ); Harry Hamlin and Lisa Rinna ( Chicago ); David Hyde Pierce, Jason Danieley, Michael McCormick, Debra Monk and Karen Ziemba ( Curtains ); Jerry Mathers and Paul Vogt ( Hairspray ), Priscilla Lopez and Mandy Gonzalez ( In the Heights ); Cheyenne Jackson and Kerry Butler ( Xanadu ); Michael Cerveris ( LoveMusik ); Jo Anne Worley, John Glover, Beth Leavel, Gerry Vichi and Patrick Wetzel ( The Drowsy Chaperone ); Ashley Brown, Jane Carr, Daniel Jenkins and Gavin Lee ( Mary Poppins ); John McMartin and Maureen Moore ( Grey Gardens ); Michael Berresse ( A Chorus Line ); John Earl Jelks ( Radio Golf ); Michael Mulheren (Deuce); J. Robert Spencer and John Lloyd Young ( Jersey Boys ); Orfeh and Andy Karl ( Legally Blonde ); David Hibbard and Martin Moran ( Spamalot ); Sebastian Arcelus, Jayne Houdyshell and Kendra Kassebaum ( Wicked ); Stephanie J. Block ; and Maureen McGovern . Shubert Alley is located between 44th and 45th Streets, between Broadway and Eighth Avenue. For more information call (212) 840-0770, ext. 477, or visit www.BroadwayBarks.com. A host of theatre favorites will be part of a July 2 benefit concert for the new theatre company 4th Meal Productions. The evening at Joe's Pub will feature the talents of Celia Keenan-Bolger ( Les Misérables, The 25th Annual Putnam County Spelling Bee ), Marya Grandy ( The Great American Trailer Park Musical, Les Misérables ), Marissa McGowan ( Les Misérables ), Deborah Craig ( The 25th Annual Putnam County Spelling Bee ), Sarah Saltzberg ( Don't Quit Your Night Job, The 25th Annual Putnam County Spelling Bee ), Wayne Wilcox ( The Light in the Piazza, Coram Boy ) and folk singer Maddy Wyatt . Show time is 11:30 PM. Tickets for the Joe's Pub concert, priced $20, are available by calling (212) 967-7555 or by visiting www.joespub.com. Joe's Pub is located within the Public Theater at 425 Lafayette Street. Tony Award winner Andrea Martin is the latest addition to the cast of the new Mel Brooks musical Young Frankenstein , which will be directed and choreographed by Susan Stroman . Martin will play the role of Frau Blucher in the new musical comedy; that role was created on screen by Cloris Leachman . Martin joins a cast that includes the previously announced Roger Bart (Dr. Frederick Frankenstein), Megan Mullally (Elizabeth), Sutton Foster (Inga), Shuler Hensley (The Monster), Fred Applegate (Kemp) and Christopher Fitzgerald (Igor). Young Frankenstein will begin previews at Broadway's Hilton Theatre Oct. 11 with an official opening Nov. 8. The songs of Tony Award winners Stephen Flaherty and Lynn Ahrens will be presented Nov. 8-11 at Broadway By the Bay in San Mateo, CA. Entitled Ahrens & Flaherty: Words & Music , the concerts will feature songwriters Ahrens and Flaherty as well as Broadway actors Marin Mazzie and Jason Danieley . Mazzie and Danieley will perform songs from such Ahrens and Flaherty musicals as Ragtime, Once On This Island and Seussical . Broadway By the Bay is located at 600 North Delaware Avenue in San Mateo, CA. For tickets call (650) 579-5565 or visit www.broadwaybythebay.org.